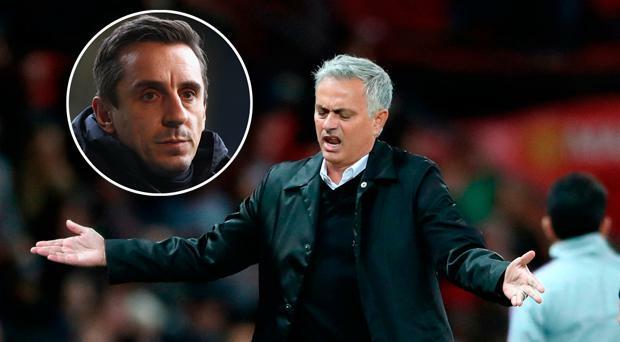 Manchester United legend Gary Neville believes Jose Mourinho's current squad are 'miles behind' local rivals Manchester City after their comprehensive 3-1 defeat in the derby at the Etihad Stadium on Sunday. United are 12 points behind City just a dozen games into the Premier League season and have a negative goal different, with Neville telling Sky Sports that it will take a long time for his former club to close the gap that has opened up between them and their rivals. "Obviously, Manchester United's ultimate goal has to be to win a Premier League trophy but to win a title you need to look at the whole team," he stated. "They can't keep a clean sheet, their midfield can't pass the ball forward and their front three don't have the precision and ruthlessness of Liverpool or City. So they aren't going to win titles because in every part of the pitch they are behind the team's going for a title. "It's sobering really. You could argue this is a far better Manchester City team but United should be a lot closer, they are under-achieving in terms of how they have started the season. They are miles in front of Manchester United at this time. "It's worrying because the teams have spent similar money over the last two or three years but every time you watch them play, Manchester United are playing on scrap. They are looking for that set-piece, that mistake from Ederson for the goal, or a moment of magic from one of their talented players, but there isn't really a plan to damage Manchester City pro-actively because they don't feel good enough. "It's sobering to say but we shouldn't compare Manchester United with Manchester City - watching both at this moment in time there is an absolute gulf between them. "A 12-point gap is about right after 12 games and United's biggest problem isn't Manchester City but how to get closer to the rest of the top four and into that race. At this moment in time City are at a different level all over the pitch to everyone. Neville's former United team-mate Paul Ince was equally scathing of Mourinho and his team, as the Paddy Power ambassador gave this cutting critique. "United never looked like they were going to win the derby. In fact, they never even looked like they wanted to," said Ince. "They looked scared of Man City, and that’s not the way it should be. In Jose Mourinho style, they were set up as though they were terrified of conceding any goals, and didn’t want to try and outscore them either. "Once City got the first goal, they didn’t make any attempt whatsoever to get back to the game. And, even when they tried, they just weren’t good enough. We’ve been bigging up Anthony Martial for weeks – myself included – but ultimately, he didn’t perform in that game, and they’re the ones that really count. "Even after the penalty, you’d expect a United side to come out fighting, but in fact they were terrified of City. At no stage in the game, did I watch it and think United could win it – how sad is that?"